Genevieve was born on the first business day of 2012. 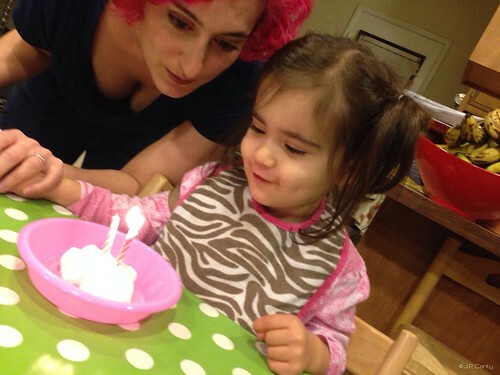 One of my blog readers warned me to be careful not to let the holidays eclipse Genevieve's birthday, mainly from her own experience of having her New Year's Day birthday eclipsed every. Single. Year. "I won't do that," I promised myself. "What kind of mother lets the holidays overshadow her baby?" In the whirlwind of the Thanksgiving/Christmas/New Year's madness (now with more madness! One less week! ), I didn't realize that Genevieve's birthday was a mere TWO DAYS after New Year. As we say around these parts: Oops . So, I let all of our family (and closest friends) know that we would be celebrating the following weekend. "To give everyone a short break from all the holiday business," I said, flexing the truth, just the tiniest bit. Then, I promptly went to Pinterest, my favorite source for finding other people's brilliant, creative, marvelous ideas. I searched "Two year old birthday party." 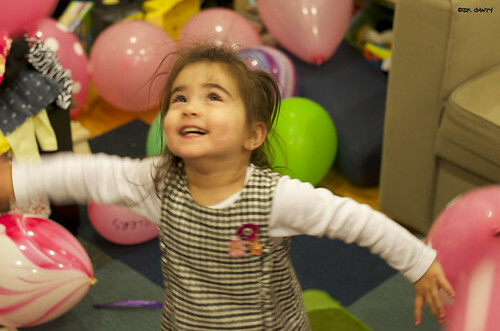 Instead of wallowing in the "I barely remembered the day," guilt, and the "There is no way I have the time or energy to do ANY of this," I thought about what the most important part of Genevieve's birthday celebration should be: Genevieve. The same applies to a child's party that takes twenty hours of prep time. Twenty hours of doing things *for* Genevieve, when really, she'd prefer to read with me, or play together on the floor, or do anything other than play by herself while I work myself mad. I really feel like an important part of parenting is recognizing what your kids *really* want and need. I could do the elaborate stuff, but Genevieve would get maaaaaaybe ten minutes of fun out of it. Not a great return on the time invested. So, I thought about what Genevieve loves to do. Play at the park. Read books. Play with balloons- BINGO! 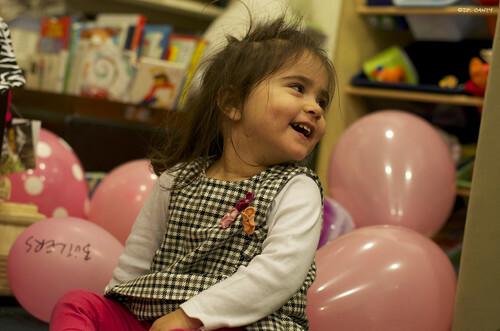 We would fill the living room with balloons, and she could play with them as much as her fuzzy little heart desired. We served crudités for snacks (Genevieve's favorites, of course), and did a build-your-own sandwich bar for lunch. We got a couple of different cakes from Bijan's (our favorite bakery), and part of the entertainment was blowing up the balloons, of course. 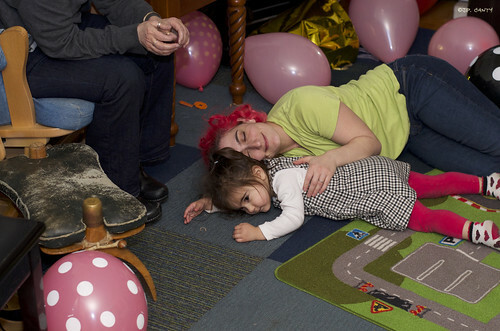 We scheduled the party from 10-1, so that naptime could be observed without interruption and that all parties involved would have a great day. 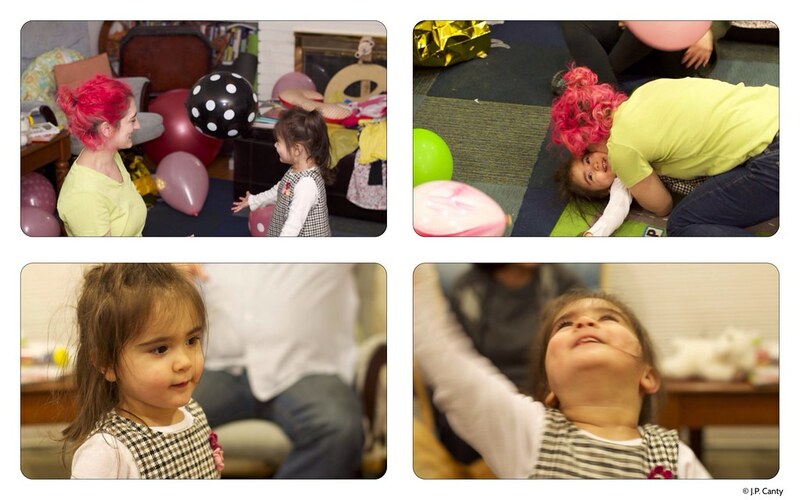 And after playing in the balloons all morning, I can tell you that she went down for that nap HARD. When she woke up the BALLOONS WERE STILL THERE. So, we played in them some more. Balloons are fun. But exhausting. Since we're all about returns on investment, and getting a good value? The balloons are still in the living room, and as they lose their oomph, they slowly disappear. Which is why our Christmas tree is still up. We're maximizing the return on our investment. Jasmin, you and your mother are both brilliant mothers! I love the theme of this blog entry: the party is a way to maximize the fun for your daughter - all of the fun involved including the prep and the 'after party'. Thank you, again, for sharing your lives with us out here in internet world! So fun & so inspiring!! Thanks for sharing your talents and all that you do - to you & your mom & Andrew & Genevieve! 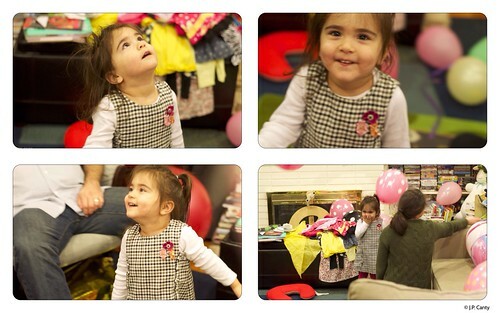 love this post, and LOVE the pics :) What a blessing of a 2nd birthday! 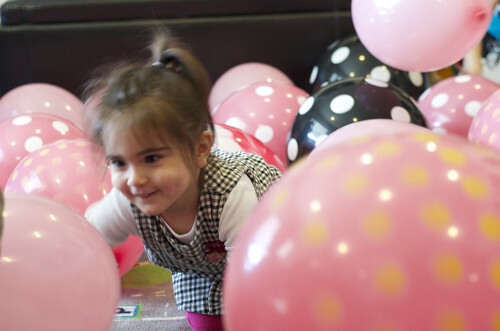 What a wonderful idea for a birthday party - looked like so much fun! Love the idea of "with" or "for". "With" is way better! Happy birthday Genevieve! 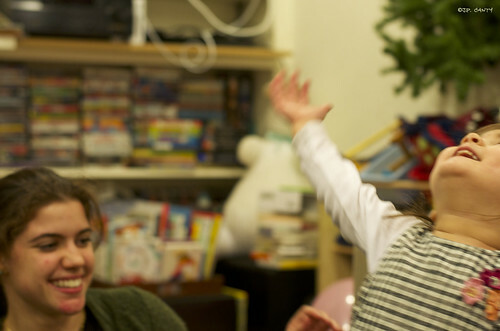 That looks like a fantastic party and a very happy kiddo. 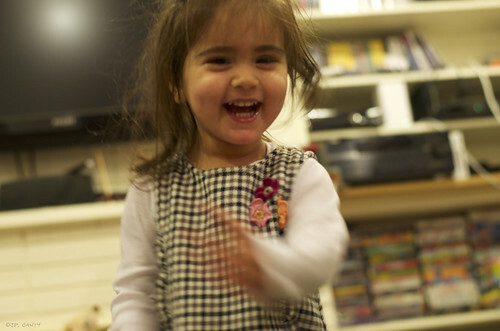 She is too precious for words!